The new Classic '05 Ford Mustang ! The 2005 Mustang, may well be known as the car that brought the muscle car back. And it certainly was the car model that brought Ford back to the cutting edge in retro looking, modern high performance sports cars. The look for the new 05 Mustang was designed to incorporate some of the defining styling cues from the popular, 1965 to early 1970's cars. With their aggressive and powerful looking haunches at the rear Ford engineers wanted to recreate some of the style and performance associated with the original Mustang. Some say the styling reflects the 1967 to 1968 fastback Mustangs, but there are other instances where you can see the 1969 and 1970 cars, and even some Shelby thrown in for good measure. Like many other current cars ( eg. Dodge Challenger ), these pony cars are substantially bigger than their early counterparts, but they have such a well thought out design, that they appear more compact than they really are. Ford brought back the classic fastback look, complete with the familiar triangular rear quarter windows, which shortly after it hit the showroom floors, saw aftermarket parts makers supplying cool retro louvers. The convertible was back and looked like it was actually designed to be there. Although at 3,300 lbs the new car was heavier than an original 1965 machine, it was certainly respectable. By comparison, the 1972 Mustang Mach 1, with a 351 V8 and 2 barrel carburetor was only rated at 177 horsepower and set in a 3,400 lb car! Ford designed a good looking interior for the 2005 Mustang. Nice rounded gauges and a console to house the shifter were added, along with supportive seats and lots of leg room (at least for the front occupants ). The engine choices for the 2005 car include, finally, a peppy fuel injected 4.0 liter V6 producing 210 horsepower and great fuel economy. And a 4.6 liter V8 with producing a solid 300 horsepower is available in the new Mustang GT. Transmission choices for the new pony car are a 5 speed automatic or a 5 speed manual transmission. The interior of the new Mustang interior is very similar to the concept drawings and auto show concept car. Spy pictures from 2003 showed a car that externally is a combination of the 2005 and 2010 car with a bit of Shelby rear thrown into the mix. The concept cars sported huge Brembo brakes and calipers, which didn't arrive with the new model, but don't worry, you can still find them along with many other performance parts. If you're in the market for a used coupe or convertible, here's a guide to finding the best 2005 Ford Mustang prices. Get better sound and freer flowing exhaust with a Mustang GT takeoff muffler . For between $50 and $100 and 20-30 minutes work, it's a great addition to the looks, sound and performance of your Mustang V^. Follow the link for complete installation instructions. How to remove a 2005 Mustang door Panel. Whether you're adding new speakers or fixing a problem, here's how to safely and easily remove your 05 Mustang door panel. If it's time to replace your rear disc pads or rotors, check out this important tech article. 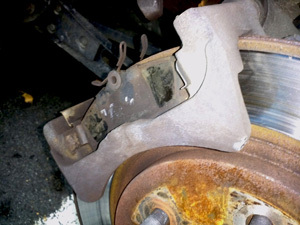 These rear disc calipers have need a special procedure and tool to safely remove and replace the pads. Here's the full 2005 Mustang rear brake replacement procedure. 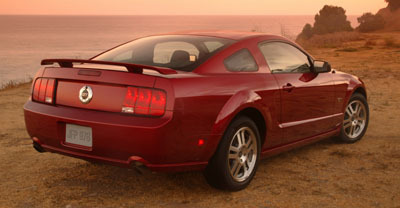 Return to the 2005-2010 Mustang listings. Return from 2005 Mustang to Ford Mustang Home .